We want more power in a smaller package. It’s a challenging trend that’s popular in a lot of industries. In off-highway construction equipment, the quest for more power or at least equal power in a reduced size can be found in everything from engine designs to complete machine concepts. 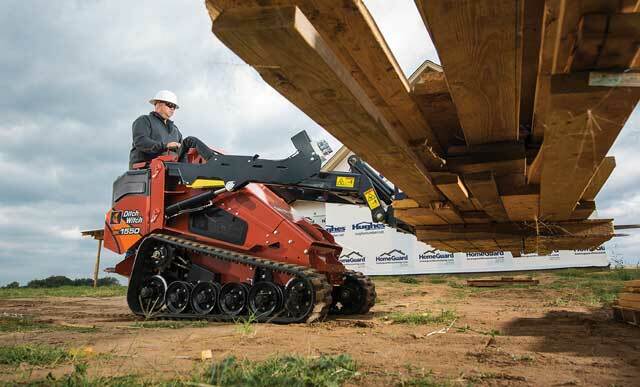 One of the smallest categories of diesel-powered attachment takers is the compact tool carrier (big photo above). Sometimes called mini skid steers or compact utility loaders, depending on the manufacturer, compact tool carriers personify that big power and small footprint trend. Even more so, over the last 20-plus years compact tool carriers have morphed from wheeled, medium-power supplemental equipment to track-driven, spec heavy jobsite project leaders. The size, power and versatility of compact tool carriers have significantly increased sales over the decades to somewhere in the 10,000 units sold range in 2018. These walk-behind or ride-on units can be seen everywhere — as nimble earth and mulch movers on your neighbor’s landscape project, brawny demo units on that grocery store parking lot job or dedicated fence or footer machines preserving expensive lawns at that big office building. Manufacturers such as Toro, Bobcat, Ditch Witch, Boxer, Triple E Equipment, Ramrod and Vermeer are all selling compact tool carriers today. 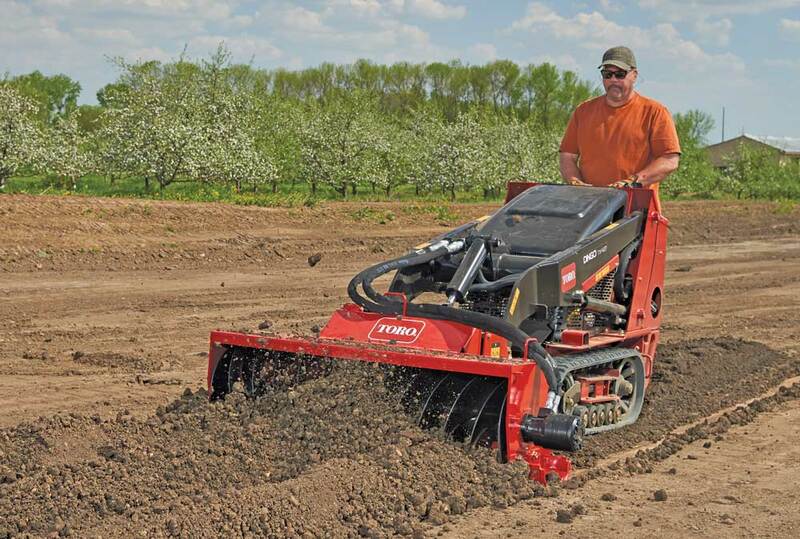 Think of them as skid steers or track loaders without a cab. They use a similar universal quick-attachment plate (some can even take a skid steer quick-attach plate), they come on wheels and tracks and they have a zero turning radius that’s ideal for tight quarters. Buyers have a bevy of options: stand-on and walk-behind units; hydraulic flow rates from 8 to 16 gpm; gas, diesel and electric engines; wheels or dedicated track undercarriages; and a zillion different attachments. The American market has a wide variety of sizes and options. 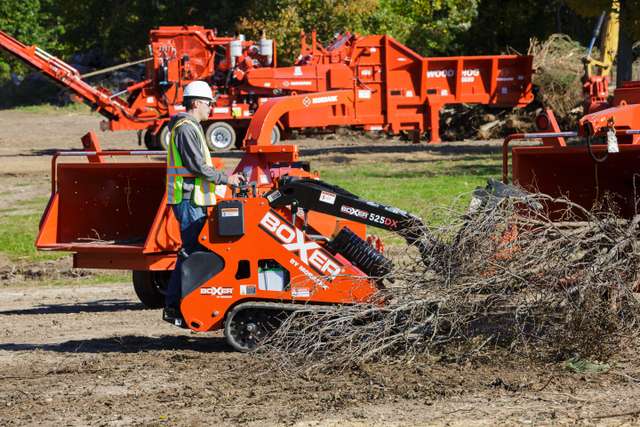 The Boxer 320 mini skid steer is a gas-powered unit that offers a 20.5-hp Kohler engine, 1,088-lb tip capacity, 1,760-lb operating weight and a 34.5-in. width to fit through a standard gate. Because of its size, the 320 is ideal for the rental industry. Ditch Witch and Vermeer boast some of the biggest units with 40-hp engines, 16 gpm of hydraulic power (3,000 to 3,700 psi) to the attachment, lift heights above 7 ft and big tip capacities from 3,000 to 4,400 lbs plus. Bobcat, Boxer and Toro offer a lot of units in the middle range of the market. The Toro Co. did shake up the industry last year with an enormous entry called the TXL 2000. A unique machine to the industry, the TXL 2000 is the biggest compact tool carrier on the market with telescoping loader arms that go over 10 ft, a rated operating capacity of 2,000 lbs and all the benefits of a standard compact tool carrier. Toro’s Dingo compact utility loader line (the company’s name for its CTCs) turned 20 years old in 2018. The first Dingo in the early ‘80s (long before the Toro acquisition) was a 10-hp machine that was closer to a powered wheelbarrow than a compact tool carrier. In 1995 when Toro acquired the rights to the Dingo, the latest model was a non-Toro branded Dingo 950, which featured a twin-pump hydraulic system and a 20-hp engine. Despite the growth in size and power of today’s units, these are still intuitive machines to operate. Some manufacturers like Boxer allow you to jump on, using only spring-cushioned, ride-on platforms on its units. There are also walk-behind units. Toro Dingos come with or without dedicated platforms, and Bobcat offers ride-on platforms that can be detached for walk-behind operations. Most of the market utilizes diesel engines from the likes of Kubota and Yanmar, but gas and electric options are available. The Triple E Equipment brand specializes in battery-powered compact tool carriers, and Toro displayed an electric concept unit at The ARA Show in Anaheim, Calif., in February. All of these machines have impressive attachment hydraulic systems. Of course, the name of the game is attachments and implements. Compact tool carriers are built to run hydraulic and non-hydraulic attachments like buckets, breakers, brooms, blades, backhoes and box scrapers (and that’s just the Bs). There is a universal compact tool carrier mounting plate and quick-attach system to quickly and easily switch between any standard attachments, and there are adaptor mounting kits on the aftermarket for proprietary attachment systems from brands. Today’s CTC hydraulic systems require routine maintenance and operational best practices to ensure efficiency and longevity. First order of business: Before a project even begins, match the flow rate of the hydraulic system with what is needed to operate the attachment. An incorrect match can reduce the efficiency of the attachment by decreasing how quickly the machine operates or how well the attachment works. These systems have evolved a long way since the first American models in the late ‘90s, but there is still a lot you can break. According to Cartwright, today’s compact tool carriers can feature anywhere from a two-pump to a four-pump system, which delivers hydraulic power to various systems. Most compact tool carriers still utilize gear pumps to provide flow for loader and auxiliary functions, but sometimes the flows of two pumps are combined to maximize flow to the attachment and other times the loader and attachment flows are kept separate. “It depends on the flows needed for each for getting a good lift or lower speed on the loader while maximizing horsepower to the attachment,” says Cartwright. A good place to learn about the hydraulic workings of your compact tool carrier is the operator’s manual, which will detail proper operation and safety and regular maintenance to optimize performance. The unit will require routine hydraulic health inspections. Low fluid levels might indicate a leak. Another maintenance recommendation that could be done daily is checking hydraulic hoses for leaks. 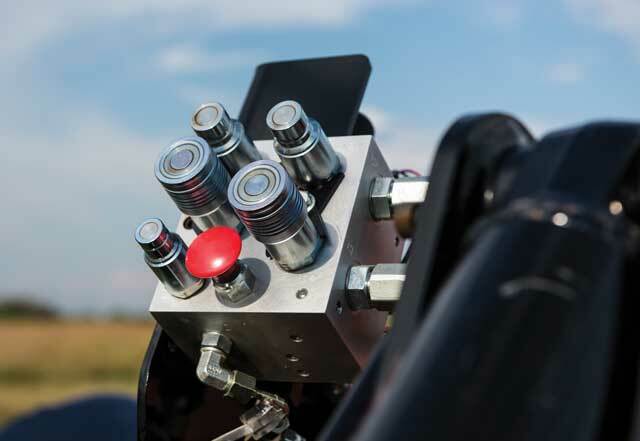 Before powering the machine, operators should visually inspect the hoses for frays. After a visual inspection, the machine should be powered to visually inspect the hoses again. If an operator thinks there is a leak, they should not test the hose with their hand, which can cause a hydraulic cut. A piece of cardboard or other surface can reveal whether the hose is releasing fluid. “Keeping the quick-connect system clean and free of debris is important too,” says Thompson. After 200 hours, contractors should replace the hydraulic filter, which helps ensure the integrity of the hydraulic fluid and protect important components. To do this, technicians will want to place a drain pan under the filter and replace it. After replacement of the filter, technicians should allow the engine to run for about two minutes to purge all air from the system. A visual inspection with the engine turned off is an important step at this point. By Kyle Cartwright, Associate Marketing Manager at The Toro Co.
Read, understand and follow the instructions in the machine’s operator’s manual. By understanding the operator’s manual, not only will the contractor gain a better understanding of how best to service the machine but will also learn how to operate the machine in a way that can minimize issues with all of the machine’s components, not just the hydraulic system. Perform all recommended routine maintenance at designated intervals. This is an important step with all machinery, not just compact tool carriers. Following the old saying, “an ounce of prevention is worth a pound of cure,” can help contractors reduce downtime and costly equipment repairs down the line. Keep the service points and attachments clean to avoid liquid, dirt and debris from entering the hydraulic system. This is another general tip for all machinery but important for compact tool carriers in particular. Hydraulic systems are sealed environments, but by failing to keep the couplers and areas around the service points clean, it’s possible for debris to enter the system and create problems for the operators during use. Remember that these tips are not to be followed in place of following an operator’s manual. 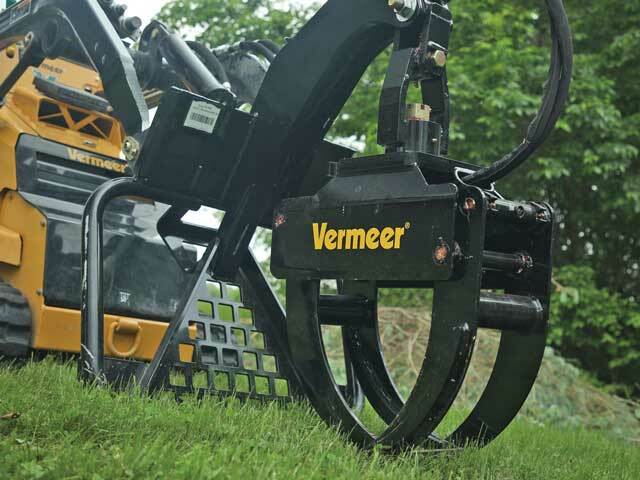 The Vermeer SLG46 swivel log grapple is the newest addition to the Vermeer mini skid steer attachment lineup. Weighing in at 515 lbs, the swivel grapple helps haul materials around a landscape or tree care jobsite. Equipped with maximized reach and swivel capabilities to help efficiently load brush chippers, the Vermeer log grapple gives operators the ability to pick up and transport material in a fluid and productive manner. For more info, visit vermeer.com. We have even more on compact tool carriers here.